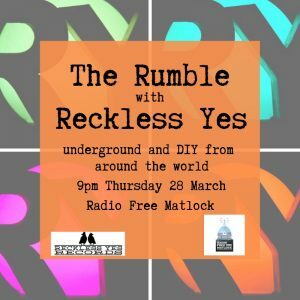 The Rumble is a monthly show bringing you an hour of the best underground, alternative and unsigned music from around the world and goes out on Radio Free Matlock the last Thursday of the month at 9pm. If you miss out you can listen again. The Rumble was previously broadcast on Radio Andra between 2015 and 2017 and you can find the last few episodes as a podcast here. If you’d like to have your band considered for the show please check out our demo submission information and send us something that way. Tune in through Radio Free Matlock and follow us on Twitter or check the hashtag #TheRumble for live tweets during the show.